Outlines are the foundation upon which your painting is built. Just as an architect uses a blueprint, an artist can use an outline to map the painting. From the Renaissance, up until rather recently, artists have used a 'cartoon' to transfer drawings onto a canvas. This cartoon was a large sheet of heavy paper that was usually thrown away after the drawing was transfered. The use of a cartoon may have crossed over to oil painting from fresco painting during the Renaissance because it was initially a fresco technique. The cartoon, in essence, is a large line drawing with minimal detail. The large volumes of the paintings are established, but more importantly, the placement of those volumes is established. This is essentially the final composition for the painting. Below, is some information about how some of my heroes used cartoons and outlines to translate beautiful images with clarity. William-Adolphe Bouguereau understood the importance of an outline in his sketches and final painting. It's very difficult to get images of cartoons by academic painters because they were mostly thrown away, but on the right is one cartoon by Bouguereau for his 1873 painting, Nymphs and Satyr. This is not the final cartoon, since the figures have changed poses, but you can see that the outlines are clear and delineated. If you want to read and see more about Bouguereau's process, HERE is a great article from the Grand Central Academy of Art. Another man who I have learned a lot from is Hayao Miyazaki. Miyazaki uses outlines to translate clear messages. Below is a youtube video about the creation of his animated movie Princess Mononoke (1997). Nearly the entire series is on youtube (I used to watch one part every night for weeks). Even if you aren't interested in animation, you should watch this series to see the power of Miyazaki's imagination and drawing. It's extremely inspirational and still drives me to work hard everday. In previous interviews, Miyazaki has said that his technique of drawing stemmed from the European Academies, which is why I see such a strong parallel between Bouguereau and Miyazaki. Today, many western artists are not concerned with outlines, but rather focused on loose atmospheric techniques. It's possible that Western artists shifted away from 'photographic' representations in favor of looser interpretations. It's like saying, "Why would I paint that way if I could simply take a photograph?" The other thing to keep in my is that outlines are created initially and can be dissolved at any point, but you can never replace an outline that has been lost. Bouguereau uses very atmospheric techniques in his backgrounds and landscapes and loses the outline at several points, but it is always strategically planned. 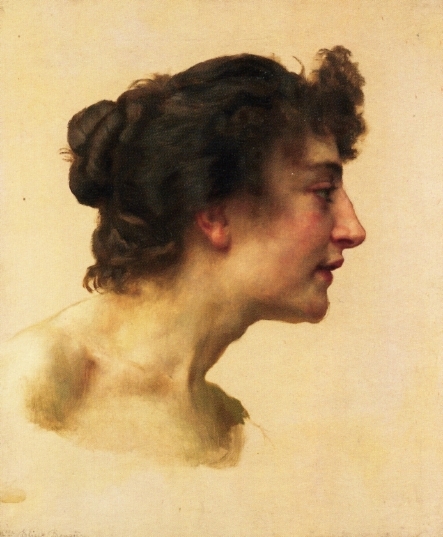 Many of head studies are also created without outlines. For me, his power is in his control of technique and the beautiful shapes that he made. The outline is the starting point, from which every academic painting should begin. Whether your beginning to sketch or ending a painting, think of the shape as well as the volume of your painting space. Simplicity is king and outlines are the purest form.